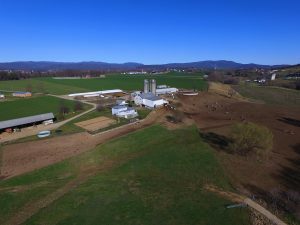 April 3, 2018, Reston, Virginia – Maryland & Virginia Milk Producers Cooperative honored four farm families for achieving the highest milk quality standards throughout the cooperative for 2017. The cooperative recognized each farm at its 98th Annual Meeting during the Member Recognition Luncheons in Carroll Valley, Pennsylvania on March 27 and March 29 in Hickory, North Carolina. 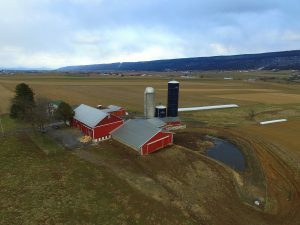 Blessed Acres Dairy, Matt and Maria Groff, Belleville, Pennsylvania In the Federal Orders 1 and 33 category for less than 3 million pounds of production, the honor went to Blessed Acres Dairy owned by Matt and Maria Groff. Matt and Maria began dairy farming two years ago and from the start, they made a commitment to ship quality milk. 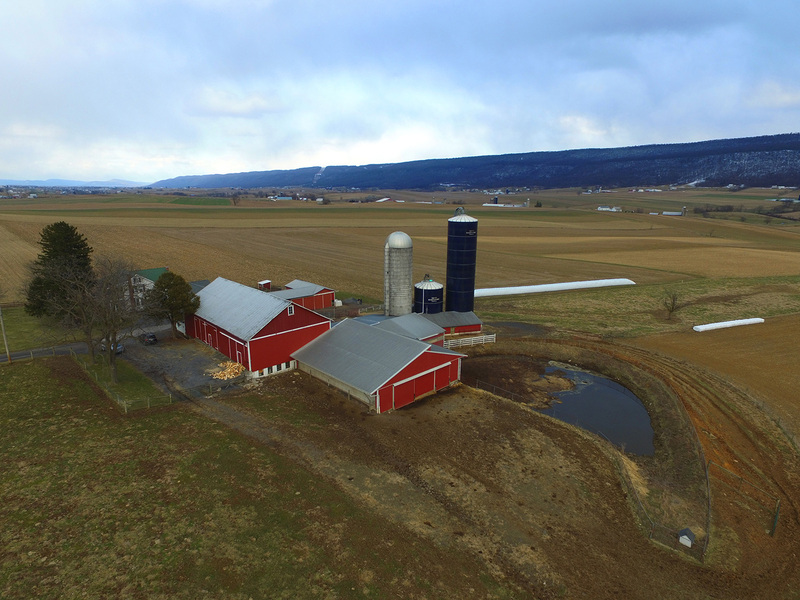 Today they are farming in Belleville, Pennsylvania on Maria’s home farm where she grew up. They have two young sons Judah (2 years) and Leland (2 months). The Groffs milk around 40 to 55 cows in a walk through 8 parlor and farm 115 acres. Their freestall barn is bedded with sawdust and the Groffs strive to keep the stalls as clean as possible. “Shipping quality milk begins with what you’re doing on the farm. Being young cooperative members, they are very enthusiastic about what they do and that enthusiasm lends to them doing a very good job,” said Robin Harchak, the Groff’s Field Representative. Matt and Maria contribute their milk quality to being able to work well together as a team. They are the only ones who milk the cows, so they’re able to be consistent with their milking protocol. “We know the cows and how much they should be milking and if something is off. We both have the same milking practice and that consistency helps,” Maria said. “If you want to farm, I feel you have to do it right,” Matt said. “And we strive to keep the cows clean and healthy and we want the best product for the consumer.” Blessed Acres Dairy Cell Counts 56,944 Somatic Cell Count 1,000 Standard Plate Count 1,558 Preliminary Incubation Count FO 1 & 33 Less than 3 million pounds of production Honorable Mentions Dorell Agar, Newville, Pennsylvania David G. Graybill, Mifflintown, Pennsylvania Brent W. Helsel, Woodbury, Pennsylvania William J. Steppe, South Williamsport, Pennsylvania Jay E. Hawbaker, Greencastle, Pennsylvania In the FO 1 and 33 Greater than 3 million pounds production category, Jay E. Hawbaker of Greencastle, Pennsylvania was the award recipient. Jay E. Hawbaker Cell Counts 63,966 Somatic Cell Count 1,333 Standard Plate Count 1,151 Preliminary Incubation Count FO 1 & 33 Greater than 3 million pounds production Honorable Mentions Arlan B. Garber, Chambersburg, Pennsylvania Kilby Farms LLC, Colora, Maryland James A. Loveday, Dundee, Ohio Stanley W. Tucker, Jefferson, Maryland The Wenger Family, Dayton, Virginia The Wenger Family of Dayton, Virginia received the top honor for the FO 5 & 7 Less than 3 million pounds production category. Norlyn Wenger and his family milk around 125 cows and farm 86 acres of owned and rented ground. Cows are housed in a freestall barn bedded with kiln dried sawdust and milked in double five herringbone parlor. Noryln and his wife have seven children and Norlyn’s father is still active on the farm at the age of 76. Noryln along with his younger sons and two younger daughters and his father all take turns with the milkings. “The two biggest contributors to our milk quality are cloth towels and the CMT paddle,” Noryln said. The Wengers recently adapted to cloth towels and rely on a uniform company to launder cloth towels for the farm. “The Wengers do an exceptional job with quality. They pay attention to detail and they want it right,” said their Field Representative Larry Seamans. “The Wengers works really hard and their hard work is reflected in the quality premiums they receive every month” According to Norlyn, he and his family try not to put any milk in the tank that they wouldn’t drink themselves. “We try to be good stewards with what the good Lord has blessed us with,” Noryln said. The Wenger Family Cell Counts 73,862 Somatic Cell Count 1,182 Standard Plate Count 2,030 Preliminary Incubation Count FO 5 & 7 Less than 3 million pounds production Honorable Mentions Collebelle Farm, Spottswood, Virginia Lee Heizer, Jr., Middlebrook, Virginia Robert Miller, Clarkrange, Tennessee Mountain View Dairy, Deer Lodge, Tennessee John O. Hardesty & Son, Berryville, Virginia In the Federal Order 5 & 7 category for greater than 3 million pounds of production, the top honor went to repeat winner John O. Hardesty & Son of Berryville, Virginia. The Hardesty family began shipping milk to Maryland & Virginia in 1950 and has a long history of shipping quality milk to the cooperative. Today Matt Hardesty, and his wife Ashley are the fourth generation on the farm. They have two young children James (2) and Lily (1 month). Matt’s parents, David and Debbie are still active on the farm, as is Matt’s brother Danny who helps part time. “Our employees are one of our top contributors to our milk quality,” Matt said. “Our employees stay on a routine and are particular about how they clean and milk our cows in the parlor,” he added. Matt and David oversee the employee training and are in the parlor a lot during milking times. The Hardestys milk their herd of Registered Holsteins three times a day. They have six dedicated full time employees and “everyone is like family,” Matt added. The Hardestys house their cows in freestall barns and newer bedded pack barns. “We feel the bedded pack is the Cadillac of cow comfort,” Ashley said. 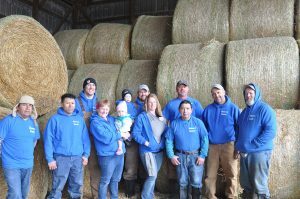 “Our freestalls are bedded with sand which we consider top of the line for cow comfort and milk quality.” The Hardestys open their farm throughout the year to school groups, 4-H groups and producer organizations. “I always try to emphasize the importance of consumer education and stress how hard we work to make sure that what leaves our farm is safe,” Ashley said. According to the Hardesty’s Field Representative Laura Jackson, “The Hardestys do a great job and care for the animals like they’re family. It’s not just a way of business; it’s a way of life for them.” John O. Hardesty & Son Cell Counts 108,035 Somatic Cell Count 1,091 Standard Plate Count 1,135 Preliminary Incubation Count Honorable Mentions FO 5 & 7 Greater than 3 million pounds of production J Team Dairy LLC, Culpeper, Virginia North Point Farm Inc. #2, Waynesboro, Virginia Riggs & Stiles, Inc., Berryville, Virginia “From the farm to the table, we expect our products to be of the highest quality,” said Maryland & Virginia Second Vice President Matt Hoff. “These four members have set an inspiring standard for the rest of the membership and we thank them and the honorable mentions for their commitment to shipping quality milk.” Congratulations to these outstanding dairy producers. Check out our You Tube Channel to see videos on our farmers: http://bit.ly/MDVAyoutube. ### Maryland & Virginia Milk Producers Cooperative is a community of dairy farm families passionate about cultivating dairy goodness. Founded in 1920, the cooperative’s farmers produce more than three billion pounds of milk a year for consumers and manufacturers worldwide. Our dairy farm families take pride in creating dairy products people crave, operating with passion and integrity, responsibly caring for our resources and providing a rewarding livelihood for our farmers and employees. Photo Captions: Blessed Acres Farm – Matt and Maria Groff, who own Blessed Acres Dairy in Belleville, Pennsylvania were the quality winner for the small farm category in Federal Order 1 and 33. Wenger Family – The Wenger Family of Dayton, Virginia received the top honors for their milk in the small farm category in Federal Order 5 and 7. Hardesty Family – The Hardesty Family were awarded the quality award in the large farm category for Federal Order 5 & 7.